Local charity zoos have produced their first animated Christmas card – and it comes with a message that’s both positive and profound. Pignton Zoo, Living Coasts in Torquay and Newquay Zoo in Cornwall are combining Christmas cheer with the serious theme of marine pollution. The one-minute animation has been produced and sponsored by Bigwave Media, the full service creative agency with offices in Exeter, Plymouth and Torquay. The video was created by Lee Potter, Creative Director of Bigwave Media. He used over 50 bespoke and stock illustrations, creating the video with a mix of special effects, puppet morph animation and traditional key-frame animations, all digitally treated through Adobe After Effects CC. The soundtrack gives a Christmas feel without being too merry, to fit the subject matter. The 68,400 frames of animations were created in just 32 hours using Adobe Illustrator and Adobe After Effects, with the deep reflections in the underwater / fishing scene being the most complicated. Sound effects including rain, snow and bubbles add atmosphere. In addition, Lee provided Santa’s whistling and the slurping of his tea! 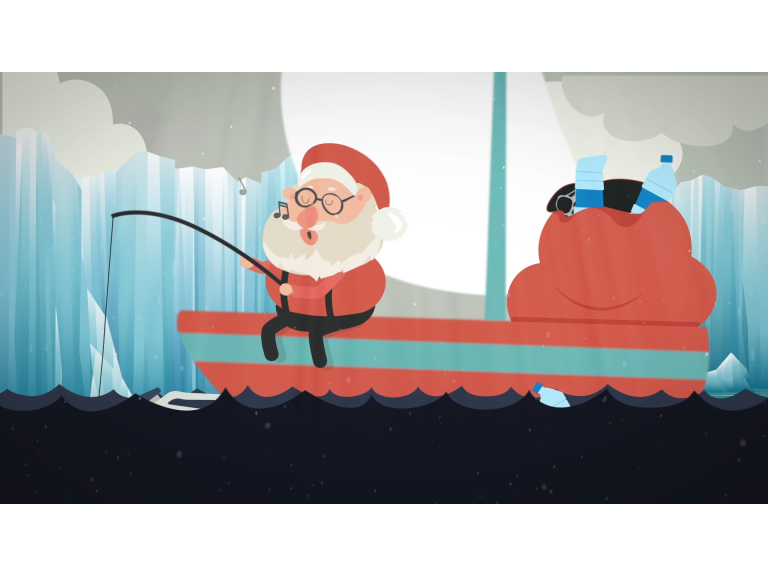 The one-minute video opens with animals in the sea swimming among rubbish and Santa fishing and reeling in the rubbish. The scene changes to his workshop, where the amazing Plast-o-Matic 2000 uses the rubbish to create gifts for him to deliver. The video card will be sent to around 45,000 recipients and the animation embedded on pages of the zoos’ websites. It will also be shared on social media platforms such as Facebook, Twitter, Instagram and YouTube and shown on the guest information screens in Paignton Zoo’s restaurant. Paignton Zoo Environmental Park is a registered charity. For more information go to www.paigntonzoo.org.uk or ring 01803 697500.